These were duelists skilled in weapons of mass construction. 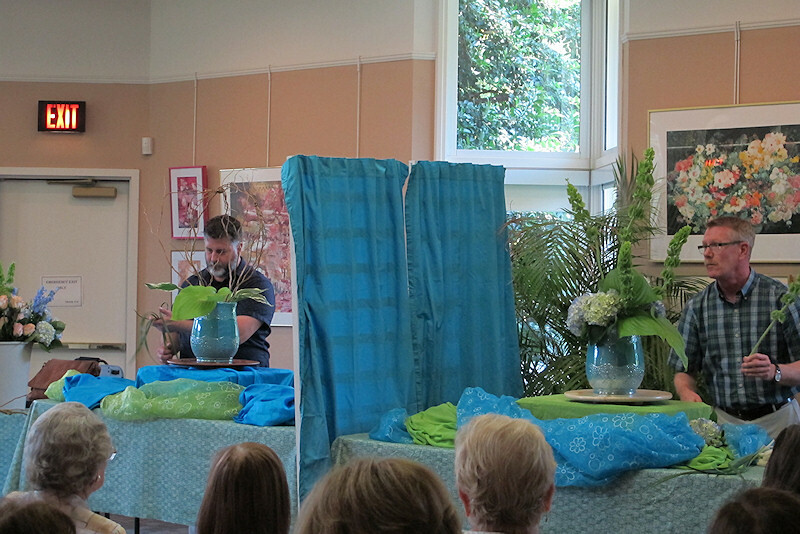 The witnesses were the attendees at Green Spring Gardens’ Dueling Designers program on Sunday afternoon, July 27. 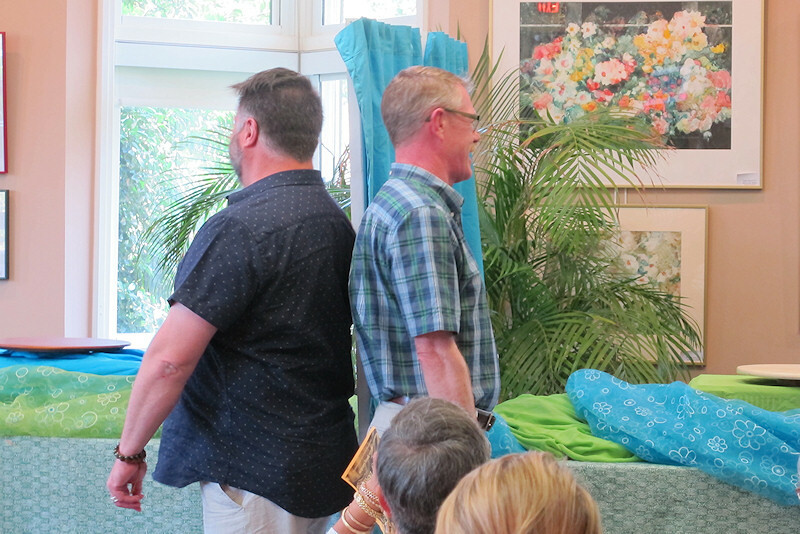 About 50 people watched as professional florists David Pippin from Richmond, Virginia, and Bryan Swann from Vienna, Virginia, designed arrangements of their choosing. Each used identical vases and the same selection of flowers, however, separated by a curtain, they could not see what the other was producing. The audience delighted in the unfolding of the individual styles. Throughout the process the guests asked questions about the mechanics of floral design and the variety of events for which the two provide arrangements. Right from the start, the differences in their styles were on display. While Swann constructed a frame of curly willow, Pippin installed a leaf and floral base for his arrangement. As Pippin arranged long stems of bells of Ireland, Swann quietly engaged in a weaving project, using green aluminum wire as the weft in his leaf-based weaving. Pippin could not resist teasing his fellow Virginia Tech alumnus about taking basket weaving as an undergraduate, while Swann explained that he had recently taken a continuing education course on the topic. He has since then exercised his creativity to add woven elements to his work. 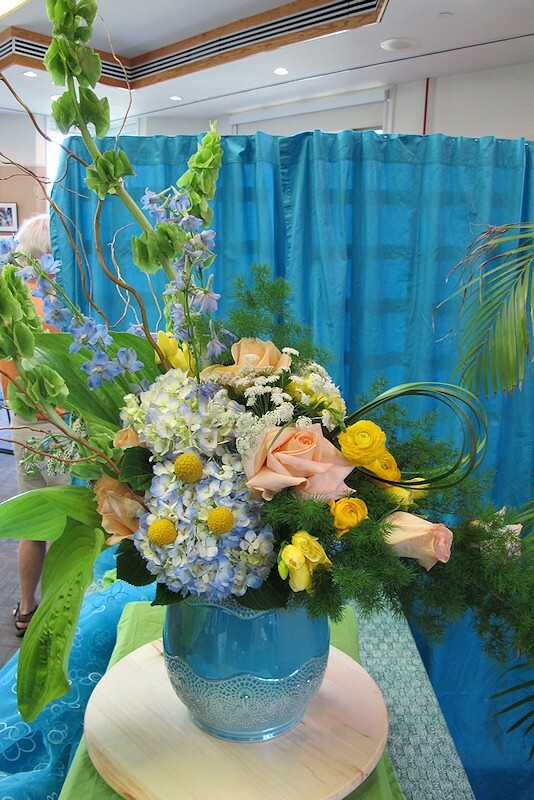 The attendees learned tricks and tips to achieve success with their own arrangements. Bells of Ireland will want to remain upright, so incorporating them as a horizontal element in an arrangement is never successful. Swann explained the importance of making fresh cuts to stems and avoiding the placement and removal of a flower multiple times, as it creates too many holes in the oasis, the green product that holds water and supports the flowers. Upon completing their work, both artists were invited to view the other’s design. Pippin’s design followed an ‘S’ shaped swoop, drawing the eye from curly willow at the top to a momentary rest on a flower cluster in the middle, ending with a fern-like spray of leaves and roses. Swann envisioned an open meadow of flowers with his arrangement, manifested by clusters of flowers suggesting the arrangement one might find in a garden. The curly willow provided height while hinting at transparency that allowed the viewer to gaze either at, or through, the arrangement. Pippin, owner of David Pippin, Inc., is currently the floral designer for The Executive Mansion of Virginia, where he provides floral arrangements for gubernatorial events. He was quite amused, in the manner of Mozart being told in the film “Amadeus” that one of his compositions had “too many notes,” that after his first event for the governor and his wife he was told the arrangements were “too flowery!” He is in demand for weddings, parties and educational events, where he shares his talents for all to enjoy or to learn. He has a sizable number of fans in Williamsburg, Virginia, who have dubbed themselves The Pippinettes. Swann is Creative Director and Director of Weddings and Special Events at Karin’s Florist in Vienna. His work is sought by brides at Meadowlark Botanical Garden and hosts of gala events at Wolf Trap Farm Park. He has won numerous awards, including the 2012 Society of American Florist VaseOff! 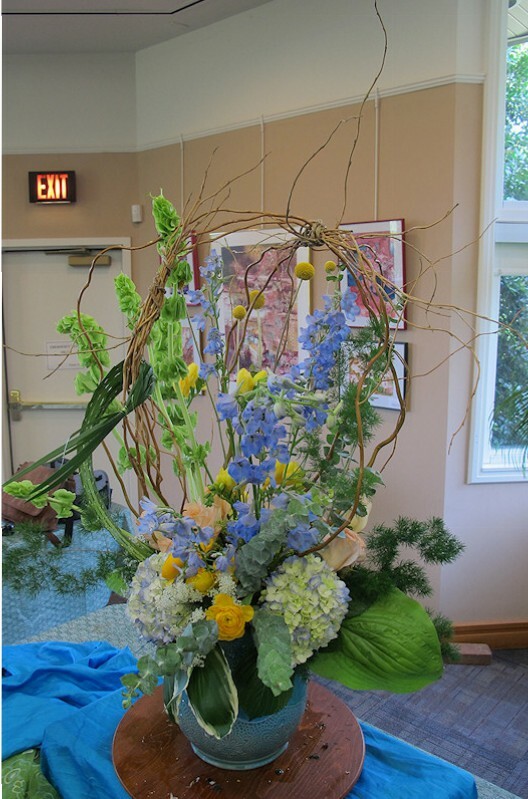 challenge and the 2014 Society of American Florist VaseOff! All Stars challenge. Floral designer Chuck Mason selected the vase and the types of flowers available to each contestant. Mason teaches floral design classes for Green Spring Gardens. Author Mary Olien is the Manager of Green Spring Gardens, which hosts floral design events among its many gardening programs for the public. 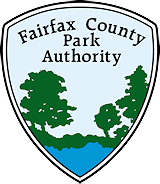 This entry was posted in Uncategorized on August 17, 2015 by Fairfax County Park Authority.